Toshiaki Toyoda has never been one for doing things in a straightforward way and so his third narrative feature sees him turning to the prison escape genre but giving it a characteristically existential twist as each of the title’s 9 Souls (ナイン・ソウルズ) search for release even outside of the literal walls of their communal cell. What begins as a quirky buddy movie about nine mismatched misfits hunting buried treasure whilst avoiding the police, ends as a melancholy character study about the fate of society’s rejected outcasts. Continuing his journey into the surreal, Toyoda’s third film is an oneiric exercise in visual poetry committed to the liberation of the form itself but also of its unlucky collection of reluctant criminals in this world or another. 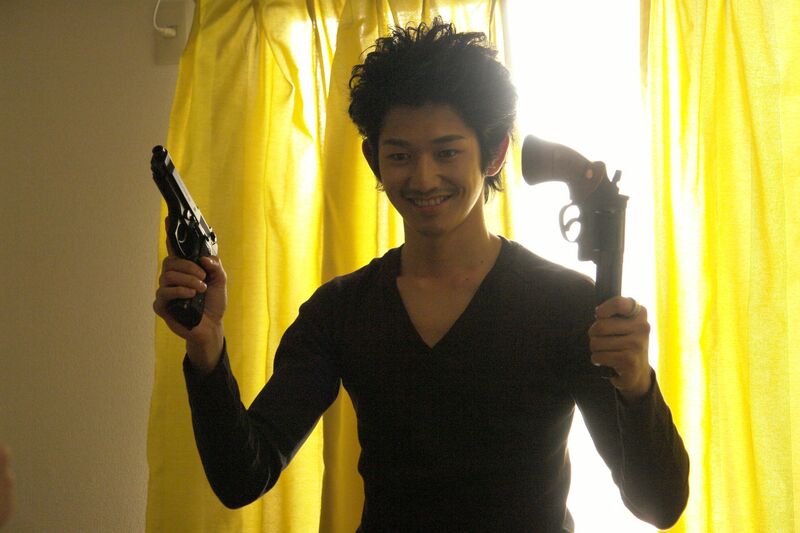 Former hikkikomori Michiru (Ryuhei Matsuda) is being thrown in at the deep end as the 10th prisoner in a crowded communal cell to which he has been consigned after the murder of his father. Not long after he arrives, one of the veteran inmates who had been assigned to him as a mentor and goes by the nickname of The King of Counterfeiters (Jun Kunimura), suddenly has some kind of psychotic episode where he goes off on a long monologue about a buried time capsule and the key to the universe before being dragged off somewhere by the guards. Right after that, a little mouse turns up signalling the probability of a mouse hole somewhere in the cell. Master escape artist Shiratori (Mame Yamada) somehow comes up with a plan to use this information in order for everyone to escape, which they do, emerging from a pipe into the blue tinted landscape and making a break for freedom. Commandeering a camper van from a young man terrified of ghosts, the gang of nine hit the road heading for a primary school where their cellmate’s time capsule promises an untold fortune in counterfeit currency. What they find there is unimpressive except for a strange looking key which they decide to give to Michiru because they’re a bunch of guys who appreciate irony. At a loss again, each begins to think about the circumstances which brought them to this point, wondering if there’s a way back or if anyone is still waiting for them. Less than a prison break movie, 9 Souls shares more in common with the return to Earth genre in which a recently deceased person is given a second chance to deal with some unfinished business until they are finally able to accept the inevitable. Though the prisoners have each committed heinous, often violent or unforgivable crimes, they each have dreams and aspirations which were previously denied to them but may just be possible now given their extremely unusual circumstances. Sometimes those dreams are heartbreakingly ordinary – falling in love, getting married and opening a small cafe in the countryside, for example, or attending your daughter’s wedding and being able to give her a wedding present in person. Try as they might, the prisoners are only able to gain a small taste of their hopes and dreams before they all come crashing down again, leaving them with only their fellow escapees to rely on. Looking forward to Toyoda’s next film, The Hanging Garden, 9 Souls also takes a sideways view of that most Japanese of topics – the family. Michiru came from an extremely dysfunctional environment in which his mother abandoned him and he was forced to kill his own father only for his younger brother to then betray him. Veteran prisoner Torakichi (Yoshio Harada) unwillingly becomes the “father” of the group though he was imprisoned for the murder of his son. This perfect symmetry of a fatherless son and sonless father adds to the circularity of Toyoda’s tale as each is forced to reassume their familial roles within the equally forced genesis of the prison cell family. In the outside world, each of the prisoners is searching for only one thing – acceptance, but each finds only that which they feared most, rejection. Once again cast out from mainstream society as they had been all their lives, the prisoners are left with nowhere else to go but the mystical destination offered to them by the counterfeiter’s magic key. The truck driver’s strange fear of ghosts comes back to haunt us at the end of the film as the van, now painted a peaceful sky blue complete with fluffy clouds as opposed to the hellish red of the ironically named “lucky hole”, begins to fill up with departing spirits each finding their exit in one way or another. A man who helped his son to die will now have to save another, while a boy who locked himself inside his room will have to turn the key and open a door on eternity. Swerving from absurd comedy to deeply melancholic meditations on guilt, redemption, and a failing society, 9 Souls is among the most poetic of Toyoda’s early works swapping the rage which imbued the young of Pornostar for the sorrowful resignation of experience. If you wake up one morning and decide you don’t like the world you’re living in, can you simply remake it by imagining it differently? The world of Hanging Garden (空中庭園, Kuchu Teien), based on the novel by Mitsuyo Kakuta, is a carefully constructed simulacrum – a place that is founded on total honesty yet is sustained by the willingness of its citizens to support and propagate the lies at its foundation. This is The Family Game 2.0 or, once more with feeling. The Kobayashis have one rule – they keep no secrets and no subject is taboo. We can see they take this approach to life seriously when daughter Mana asks her mother about the circumstances of her conception and receives an honest and frank reply. However, this “pretence” of honesty is exactly that – a superficial manifestation of an idea intended to maintain control rather than foster liberty. Each of the family keeps their secrets close be it extra marital affairs, past trauma, or just dissatisfaction with the state of current society. The very idea which binds them together also keeps them forever apart, divided by the charade of unity. Toyoda crafts his metaphors well. The hanging garden of the title belongs to the matriarch, Eriko, who has created an elegant garden space on the cramped balcony of their small flat on a housing estate. Her swinging hanging baskets give the film its odd sense of off kilter sway as the camera swirls and swoops unsteadily like a rudderless ship adrift at sea. Eriko is carefully rebuilding her world in manner more to her liking, pruning her rosebushes with intense precision both metaphorically and literally. Eriko’s intense control freakery stems back to her childhood and strained relationship with her currently hospitalised mother, Sacchan. Sacchan is one feisty grandma who may not share Eriko’s tenet of total honesty but nevertheless is inclined to tell it like it is. The central tragedy here is of maternal misconnection, a mother and daughter who refuse to be honest with each other. An encounter with Eriko’s older brother who seems to have an equally difficult relationship with Sacchan makes this plain. However, facing a health crisis and aware of reaching the final stages of her life Sacchan is also in a reflective mood and reveals that she’s recently begun dreaming her memories – revising and improving them as she goes to the point that she’s no longer sure how much of her recollection is how she would have liked things to have been rather than how they really were. Son Ko is also interested in imagined worlds only more of the technological kind where he’s created a virtual version of his real life on his computer. Something of a dreamer, he wonders if the designers of the tower block deliberately made all the windows face south so that they’d get more sunlight and people would feel happier but he’s quickly shot down with the prosaic explanation that it’s all to do with drying laundry. He’s the only one who tries to explain to his mother that her intense need for “honesty” is, ironically, just another way of avoiding reality but then everyone already knew that – it’s the final truth that underpins the value system which has defined each of their lives. However, where the family at the centre of The Family Game is shown to be hollow, the Kobayashis’ willingness to go along with this crazy self determined cosmology is driven by genuine feeling. Father Takeshi may be having affairs all over the place and even lying to his boss to facilitate them, but he wouldn’t have stayed at all if it truly meant nothing to him. Eriko plays manipulative goddess, micromanaging the fate of this tiny nation state since its inception with a keen and calculating eye but it’s all in the service of creating for herself something which she’d always felt she’d been denied – unconditional familial love, something which she also seeks to pass on to her children as the ultimate revenge on her mother whom she believes to have been cold and unfeeling. As useful a tool as honesty may be, Sacchan may have a point towards the end when she says you take your most important secrets with you to the grave. Some things lose their power once you speak them aloud, too much honesty only focuses attention on the self and is apt to make those secretive who would seek to be open. Hanging Garden is a rich and nuanced exploration of human relationships, the shifting nature of memory, and the importance of personal privacy coupled with the veneer of authenticity which makes life in a civil society possible. Take away a man’s life lie you take away his happiness – hanging gardens never take root, but they bloom all the same. Review of The Foreign Duck, The Native Duck and God in a Coin Locker over at uk-anime.net I really enjoyed this one – great movie! Director Yoshihiro Nakamura once again returns with another adaptation of a Kotaro Isaka novel, The Foreign Duck, The Native Duck and God in a Coin Locker (アヒルと鴨のコインロッカー, Ahiru to Kamo no Coin Locker). Having previously adapted Fish Story (also available from Third Window in the UK and itself a very fine film) and Golden Slumber, Nakamura and Isaka seem to have formed a very effective working relationship and this latest effort is another very welcome instalment from the duo. Elliptical, melancholic and thought provoking The Foreign Duck, The Native Duck and God in a Coin Locker is a minor gem and every bit as whimsical as its name would suggest. Shiina (Gaku Hamada) has just left the small town shoe shop his parents own to study law in Sendai. Moving into his new apartment he attracts the attention of his neighbour, Kawasaki (Eita), who overhears him signing Bob Dylan’s Blowing in the Wind. Kawasaki is himself a great admirer of Dylan remarking that his is ‘the voice of God’. Aloof, cold, at once dominating and indifferent the prospect of developing a friendship with the mild mannered, short and shy Shiina seems an odd one but nevertheless the two seem to develop a bond. Kawasaki therefore proposes Shiina help him with a rather peculiar problem. Shiina’s other neighbour, who rudely rebuffed Shina’s introduction and moving in present, is apparently a foreigner – Bhutanese to be precise – and although speaks fluent Japanese cannot read. He’s particularly perplexed by the different between ‘ahiru’ – the native duck, and ‘kamo’ – the foreign duck, and is sure that if he had a good dictionary he’d be able to understand the two fully and thus perfect his Japanese. To this end Kawasaki has decided to steal a Kanji Garden Dictionary for him and wants Shiina to help. Understandably confused Shiina originally declines but is soon bamboozled into helping anyway. There’s a lot more to all of this than a simple semantic quandary though and the only thing that’s clear is that Shiina has gone and gotten himself embroiled in someone else’s story. ‘That sounds like something you just made up’ is one of the first things Shiina says to Kawasaki and indeed everything about him seems studied or affected in someway as if he were reciting someone else’s lines – essentially performing the role of himself. Half of the crazy stuff he comes up with, like his warning Shiina to avoid a particular pet shop owner completely out of the blue, sounds as if he’s just invented it on the spot for a laugh were it not for his distant and humourless manner. Without spoiling the plot too much, you start to get the feeling that there’s really something slightly off about everything you’re being told, that crazy as it seems it is the truth in one sense but perhaps not in another. This is where the mystery element of the film begins to kick in – who is Kawasaki really? What is he on about? Is any of this really happening? Wistful in tone, The Foreign Duck, The Native Duck and God in a Coin Locker is only partly a mystery, it’s also a bittersweet coming of age tale and an, admittedly light, examination of the Japanese attitude to foreignness. Away from home for the first time Shiina is obviously keen to strike out on his own and be his own his own person but at the same time wants to fit in and be liked by his classmates. A particularly telling incident occurs when a confused Indian woman tries to get some information at a bus stop only to be ignored by those waiting. Shiina seems to feel as if he ought to help her but having just heard two of his classmates complaining about ‘stupid foreigners’ does nothing. Feeling guilty he tries to reach out to his Bhutanese neighbour but is again rebuffed. Kawasaki wants to know the difference between the foreign duck and the native one – is there such a fundamental difference? As one character says ‘you wouldn’t have talked to me if you’d known I was a foreigner’ ‘Of course I would’ Shiina replies ‘no, you wouldn’t have’ his friend responds with resignation. Isn’t it better to just help those who need it, whoever or whatever they happen to be? The Foreign Duck, The Native Duck and God in a Coin Locker maybe a little darker than its title suggests but its tone is definitely to the wistful/whimsical side – this juxtaposition might irritate some who’d rather a more straightforward mystery or a lighter, more conventional comedy but its refusal to conform is precisely what makes it so charming. That it also manages to pack in a decent amount of social commentary in an interesting way is to its credit as is its ability to make the totally bizarre seem perfectly natural. The Foreign Duck, the Native Duck and God in a Coin locker is another impressive feature from the creators of Fish Story and fans of that earlier film will certainly not be disappointed by their latest work.